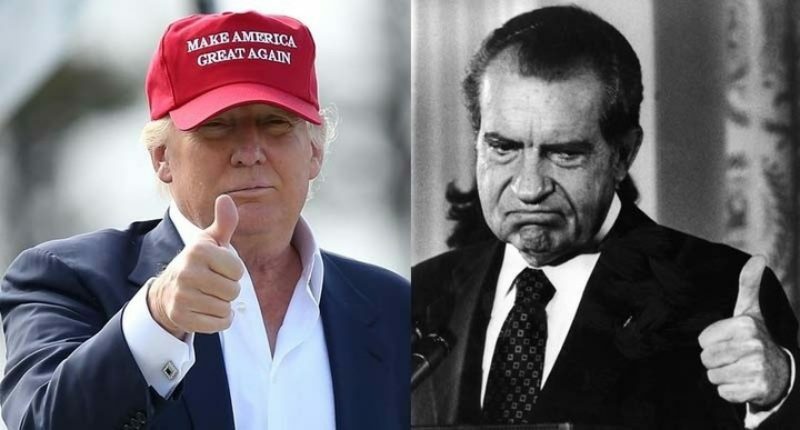 Is Trump the new Nixon? Is the current Republican President Donald Trump better, worse, or just like the previous Republican President Richard Nixon? Both Trump and Nixon ran for president more than once losing the first time around. Nixon lost to Kennedy and Trump didn't even make it past the primaries. Both are extremely paranoid. Nixon recorded phone calls and was convinced everyone was against him. Trump thinks he was wire tapped when he wasn't and thinks everyone is against him. Both hate the press. Both regularly blamed the press for the bad press they received as if it wasn't justified. Both use the presidency for revenge. Nixon often used the office as a tool to give payback to those who previously opposed him while Trump is doing that now. Nixon recorded his thoughts and conversations on tape. Trump tweets everything he thinks. They differ on the environment. There are differences however, for example, Nixon was actually pro-environment, and the EPA was established on his watch. Trump is anti-environment and is looking to get rid of the EPA. Trump isn't considered to be the brightest of fish in the sea. most people consider Nixon to be a pretty intelligent person. Yes, paranoid but intelligent enough to work with others. When it came to China Nixon met with the leaders and worked towards having a good relationship. Donald Trump on the other hand has started a trade war with China that is hurting US consumers. To answer the question is Trump the New Nixon I would have to say no. Yes, they are both Republicans who are paranoid and hate the press. But, during his Term Richard Nixon did attempt to work with the opposite party at times. He also established the EPA that Trump is trying to get rid of. And when it came down to it, Nixon was a respectable person to resign from office, compared to Trump who has tweeted that he would pardon himself when he gets charged with a crime.